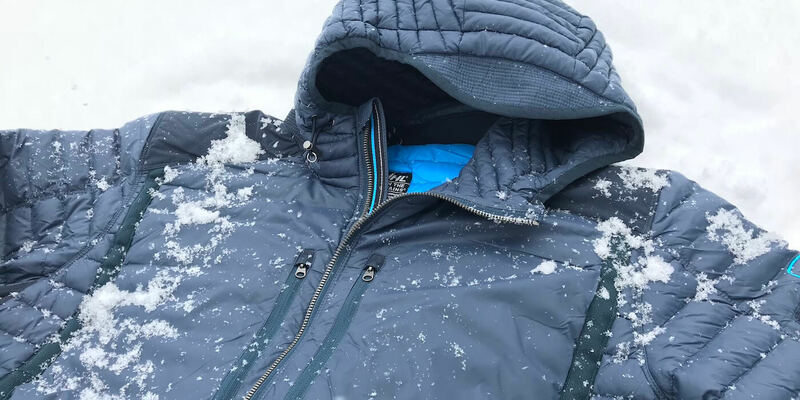 The KÜHL SPYFIRE HOODY down jacket rocks a stylish outdoor vibe while remaining surprisingly warm and functional, making it one of our best down jackets for 2018. We’re big fans. Of course, there is a bit more to this story: I am an unabashed fan of KÜHL, and it all started with a pair of pants. 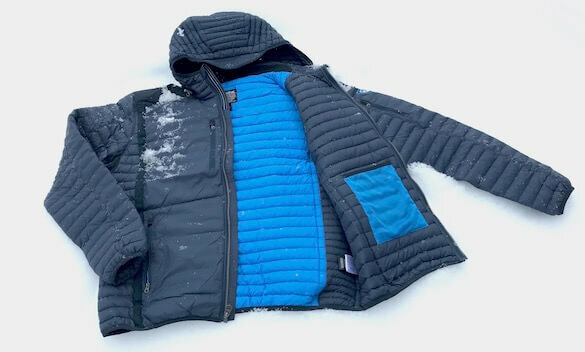 You can read the backstory if you want, but you’re probably here for the SPYFIRE HOODY review: To get Man Makes Fire a closer look, KÜHL sent us a men’s review unit in Pirate Blue. The KÜHL SPYFIRE HOODY down jacket boasts excellent fit and finish. KÜHL has its own sort of outdoor style, and I appreciate that. The small company works hard to walk the razor edge between fashion and functionality — and they frequently succeed. The KÜHL SPYFIRE HOODY is, at its heart, a highly functional down jacket. 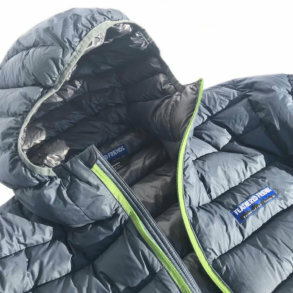 It’s not exactly an ultralight puffy, but it’s surprisingly, competitively warm. The down baffles are filled with high-quality, responsibly sourced 800 fill power goose down. The baffles are fairly small, but they’re well-packed with down. So why is the SPYFIRE surprisingly warm? I think it’s all about the fit. If you’re in reasonably good shape, the SPYFIRE fit is trim — and spot on. It does not have a massive barrel body that some manufacturers have adopted to fit a populace with growing midsections. There is no good way to say this: If you want this jacket and you’re overweight, you probably want to size up. 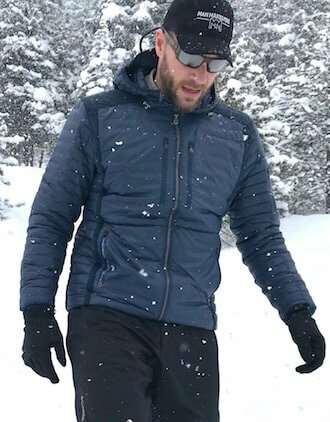 Usually, in most of our other down jacket reviews, we’re telling slim and athletically shaped readers that they might want to consider sizing down. The SPYFIRE is one of the few jackets that offers a truly athletic fit. The result? It’s warm, partially because you don’t have to heat a lot of extra space in your torso and around your arms. Other than the general overall quality, I think the trim fit is the key reason the SPYFIRE seems warmer than you might expect from its thickness. Of course, sizing down with a competitive puffy would likely achieve similar gains in warmth — as long as you don’t have long arms that would make this impossible. The KÜHL SPYFIRE HOODY has a trim fit but can still fit a wool base layer and a fleece shirt underneath. Meanwhile, back to the SPYFIRE: At first glance, you might think the SPYFIRE has a bunch of panels of different fabrics just for looks. Not so. The flat chest top sheet is made from 20D nylon that resists tears and helps block wind. The shoulder panels are made from a lightweight DWR soft-shell material that resists abrasion from equipment or backpack straps. The baffles are larger around the torso for warmth but smaller at the sides to reduce bulk. Knit underarm panels help dump excess heat. And the zippers? Robust. We’re big fans of non-ultralight zippers that do their jobs easily with strength, and the KÜHL SPYFIRE HOODY has great zippers. Plus, the SPYFIRE has two hand pockets, two chest pockets, one sleeve pocket and an inside mesh pocket. Nice. What about the hood? The hood adjusts at the front sides as well as in the back. Better yet, the hood construction lets it lay flat against your back when you’re not using it. It’s a great design. Are there any major cons? Not really. But there are three minor changes that would improve this jacket. Let me put it this way: on a scale of 1-to-10, I’ve give the SPYFIRE a 9. Why not even higher? The bottom hem is elastic — there is no adjustable draw cord. This ensures a trim fit without requiring you to think about it, but it tends to ride up a bit and then fold over itself when the jacket is zipped up. That doesn’t look necessarily bad or affect functionality, but it’s not perfect. I’d prefer a nice small drawcord — or no elastic at all, even. That hem change would bring us to a 9.3. Next, I’d ask for thumb-hole cuffs that you could tuck back under the sleeve. This would give you a bit more sleeve coverage for when you want it when you’re truly being active in the SPYFIRE. For example, if you were to raise your arms up and around, your sleeves wouldn’t slide back. This should not be such a hard change — the KÜHL FIRESTORM coat has these thumbhole cuffs, and some of KÜHL’s own product model photos actually show a guy wearing the FIRESTORM with the thumbhole sleeve cuffs tucked back under the main sleeve. It’s a brilliant design in the FIRESTORM, and I’d love to see it in the SPYFIRE. So, two minor changes, and boom, 9.6. What about the third minor change? 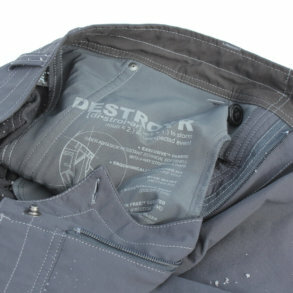 The hand pockets slide below the front nylon top sheet but above the down insulation. 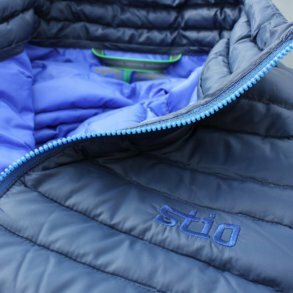 Most down jackets tend to have the pockets slip between the insulation and your body, which helps keep your hands warm. The pockets still work and will warm your hands in chilly weather, but in truly cold weather you’ll want gloves. 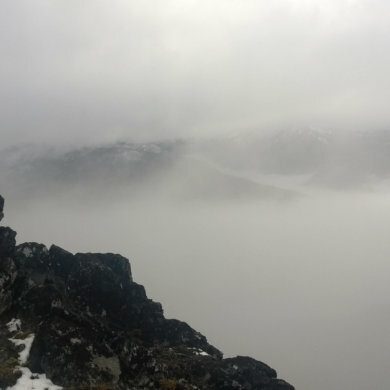 The KÜHL SPYFIRE HOODY isn’t the lightest down jacket. Still, at 16.75 ounces in an XL, it’s very light compared to most synthetic jackets. As for me, the 6 or 7 ounces above standard ultralight puffy designs is easily offset by the more robust construction and style. 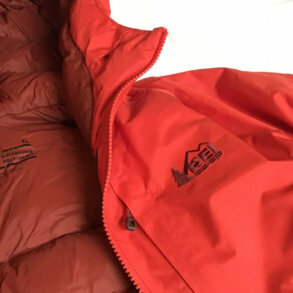 If you want a down jacket that you can wear outdoors while backpacking or hiking . . . and hit the sidewalks of a mountain town and look a little less like everyone else, those 6 ounces are totally worth it. The bottom line is that the KÜHL SPYFIRE HOODY is a great looking jacket with a true trim fit and solid overall functionality. Highly recommended.